Blogging is not just about unburdening our feelings and whinging. It can also be for a noble purpose, and this is one of those. Author Patry Francis, whose debut novel The Liar’s Diary came out in hardcover from Dutton last spring, was recently diagnosed with an aggressive form of cancer. After undergoing several surgeries, her prognosis is good. Today sees the trade paperback release of The Liar's Diary, but, since Patry won't have much energy to promote the release, a large number of blogging authors across the globe are getting together to do it for her. This is the blogsphere at its best! Read more about it on Maryanne Stahl's blog. And the good folk at Penguin are supporting this initiative: Penguin Group USA would like to offer 15% off the paperback edition of The Liar’s Diary when purchased online from us.penguingroup.com until 2/15/2008. On the shopping cart page, enter PATRY in the ‘coupon code’ field and click ‘update cart’ to activate it. It's been a while since I blogged for The Sunday Salon, mainly because Sunday isn't a day of rest over here, it's the first day of the working week. But I have found a few minutes to mention the stunning short story collection I am reading right now, All Over, by Roy Kesey, published by Dzanc Books. I was sent a review copy of this book and am reviewing it for The Short Review. I have never having read anything by Kesey, but I knew from the opening lines of the first story that he is a writer after my own heart. He loves playing with words and with language. There are quite a few words I have never heard before - I don't know if he has made them up or if I should get the dictionary out and expand my vocabulary! And some of the stories have Spanish titles, and there are characters of so many nationalities in this book, it is wondrous. I would say that Kesey falls into the quirky/magical realist camp, for the most part. A reader can't assume that he or she is in the real world when embarking on these stories, but they are so beautifully written, their worlds are so consistent and compelling, that I willingly suspended disbelief and dove in. I have read the whole collection first as a reader and am now re-reading it with my reviewer's hat on, and seeing things I didn't see the first time through - certain themes, the way endings are both shocking and satisying, a lack of names and places. Several of the stories seem totally nonsensical, yet they also manage to be poignant and sharp. There are several stories that just didn't speak to me, as is the case with most collections. I didn't "get" what was going on, I was left too confused. But for the most part, I highly recommend this to all lovers of language and fantastic - and fantastical - writing. You have to bring your own cup of tea or coffee but come inside and take part in Cafe Improv where you can write the next installment of a group story. Or heckle. You are also very welcome to submit your own new fiction writing to the site. Or advice about writing. The cafe is also keen to showcase bands, comedians and still or moving pictures. Work is published regularly. Guidelines are available by clicking on the Submit work button. If you visit Chatter you can post and read any messages asking for or offering help or work. You can post whatever you like although The Management will frown on anything including the words 'bigger', 'satisfied', 'left to you in a will', 'just days to go'. You can also browse work by the cafe's current writers. Some of it has already been published or won prizes and much of it is premiering here. If you are spectacularly impressed with something you read please do contact the writers directly or visit their own weblinks. Those details should be presented with their work. All copyrights belong to the artists and not this site so you will need to approach them for any permissions. Private 'rooms' are available, for free of course, for any writing groups wanting a place to meet and workshop ideas but whose members don't want their work plastered all over the web, yet. For technical reasons this will be administered by the cafe but otherwise only members using a password will be able to enter. I, for one, am going for it: here is my showcase page. A great thing for any writer, I wish her loads of luck with it! On her marvellous site and blog, which are a must for any writer, Kelly Spitzer has begun a series called Get Real, where she asks writers and editors to talk about different aspects of writing and publishing. The first round was "Get Real: Writers and Editors discuss the Publishing Process", more specifically, The Rejection Letter. The second Get Real round has just gone up, a fascinating look at writers' views on Online vs. Print Publishing. I am one of the writers participating in this, and it's been interesting to examine the process, as well as to read what everyone else has to say. Check it out. Created to make up for the lack of reviews currently allocated to the short story genre, this user-friendly site provides a much needed platform for original reviews of story collections and anthologies. New as well as classic collections are covered, giving those who aren't overly familiar with the genre recommendations with which to catch up. Reviews are written by short story writers with many including links to reviews by other publications, for quick, easy access to more opinions. The simple, clean design makes navigating your way around the site very easy and the "if you liked this you might also like' link attached to each review is a helpful addition. The browse feature also gives you several ways to search for something to read. 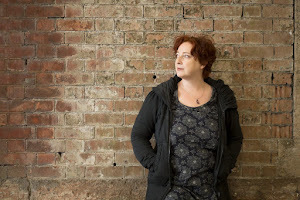 Follow the links to the site's founder and editor Tania Hershman's blog for more reviews - and your chance to comment. This is a wonderful endorsement and should, I hope, draw more people to The Short Review and give short story collections more exposure. Thank you, Mslexia! "Each issue combines the work of a different flash fiction writer with art specifically created or selected for that story." Three such postcards just arrived in my mailbox, which for me is a double treat: real mail, which hardly ever arrives any more, coupled with a short story, beautifully-presented. $20 gets you a one-year subscription, wherever you happen to be in the world, and, displaying even greater ingenuity, they are offering a framed issue for $10. Can you tell how impressed I am? The stories are great, too, by the way. , Ny Times Talks, and the The BBC World service World Book Club! Heaven... There I am on the treadmill, pounding away, an interview with Phillip Pullman going on in my head, or giggling to Simon Mayo and friends reviewing a book about Genghis Khan, or Jumpa Lahiri reading and discussing a William Trevor short story that was published in the NewYorker thirty years ago. The thing is, I pretend that this is all research. It's book talk, isn't it? Writers, readers, reviews.... But when does it become all research and no writing? This is dangerous stuff, this podcasting business. Will the novelty wear off? This is also dangerous, and not because I might pull something. No... it's dangerous because that little voice in my head says, Oh no, you can't write now, you have to go and get fit, nothing more important than that. Well, actually, there is something that is just as important to me. Going to the gym might make me feel good, boost my mood, take a few cms off the hips, but it wears me out, doesn't exactly ready me for a good hour or two's writing. It's distraction, wrapped up as something else. Yes, writing this blog is also distraction, but I only allowed myself to do it after I had written the beginning of something new (that I then deleted by mistake but actually was quite happy about, since it wasn't going anywhere, but it served its purpose by getting the juices flowing), edited one story and submitted it, and started rewriting another story as a flash (love doing this... it really helps). Discipline. I need more of it. Where do all these collections go? I have spent hours and hours on a new feature on The Short Review site: a list of the short story collections that are scheduled to be published in 2008. I had never seen such a list and I thought it would be interesting, for me, for other short story writers, and for those who love to read them. You can find it here. Frankly, I was astonished at what I found. It took a lot of work - I went through Amazon.com and Amazon.co.uk with a fine tooth comb because when I did a search for “short stories” hundreds of results came up but I had to check each one and many of them were not actually short story collections. (Not sure how Amazon’s search algorithms work!) But it was wonderful because I found hundreds of collections of all flavours: in English, in translations, new collections, re-releases of classics, lots of Best of… everything, sci fi, erotica, gay stories, Bedouin women’s fiction… A treasure trove of reading material. I am still working on it because I am finding new titles all the time - please let me know if you have a title to add - but it also makes me sad. I had no idea that this number of collections and anthologies was being published (presumably last year was similar) and I am a fan of the short story who is actively looking for collections to read. How many of them actually sell decent numbers? How many of them get decent reviews? What happens to all these collections? I do know, of course, that of the thousands of novels published each year, only a small fraction of those get attention, that a novelist - whether new or with several books under her or his belt - faces quite a challenge getting a book into the review sections. It’s a very tough market. If you are the author of a collection coming out this year, maybe you’d like to keep us abreast on The Short Review blog of what happens when your collection is published, and what you and your publishers have to do to get the word out. If 2007 was the year your collection came out, let us know how that went. In the meantime, the list is growing and growing…. A New Year, ten new reviews, author interviews, a sneak preview of short story collections forthcoming in 2008……these are just some of the treats on offer in Issue 3 of The Short Review. If you haven’t already, pop into the site and sign up for our mailing list so you don’t miss out. Head over and find yourself something to read.